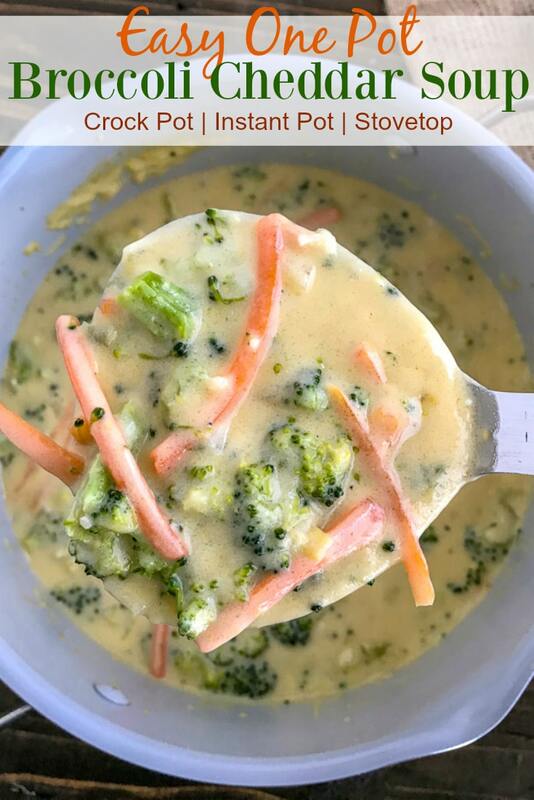 If you’re a fan of Panera’s Broccoli Cheese Soup, then you’re in for a real treat with this homemade Easy One Pot Broccoli Cheddar Soup! Everything comes together effortlessly and easily in one pot in around 30 minutes. Perfect to have on hand during these frigid winter months. 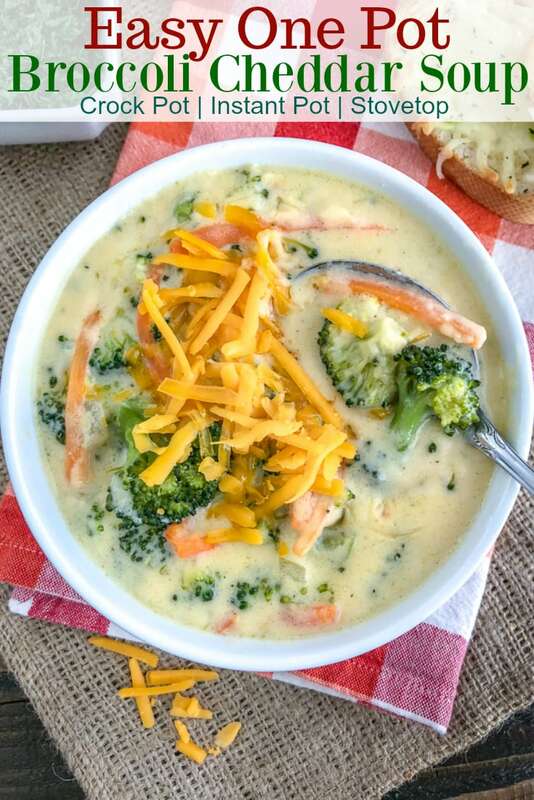 This soup comes together in around 30 minutes, is creamy and savory, and it’s made with freshly grated sharp cheddar cheese. 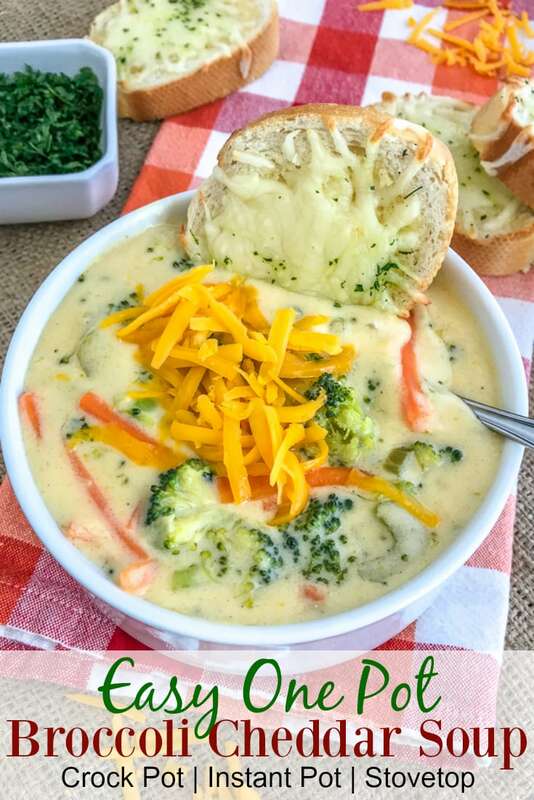 Loaded with chunks of broccoli, carrots, and celery and guaranteed to warm you through these cold few months. Snow, snow, snow, snow, snow here in Michigan! 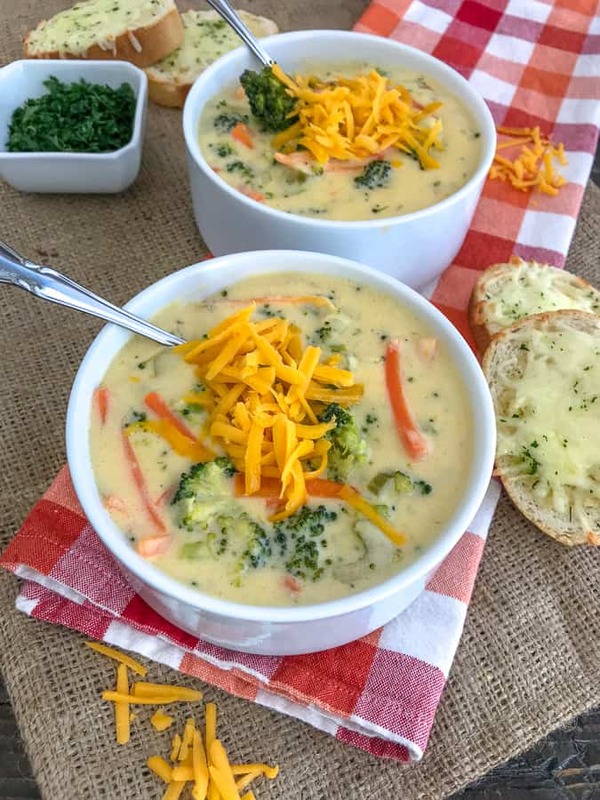 We are currently under a winter weather advisory and I am going to be as happy as a clam all warm under a heated blanket with a bowl of this Easy One Pot Broccoli Cheddar Soup. If there is one thing that I love most during the winter months, it’s a hot cup of coffee in the morning and putting a pot on the stove to make some savory soups. Lately we have been making Instant Pot Chicken Noodle Soup, Easy Instant Pot Chicken Taco Soup, and One Pot Sausage Tortellini Tomato Soup. All are so easy to make, full of flavor and soothing to the soul. They will warm you to your toes! Look at those chunks of broccoli and thickly-cut julienned carrots. 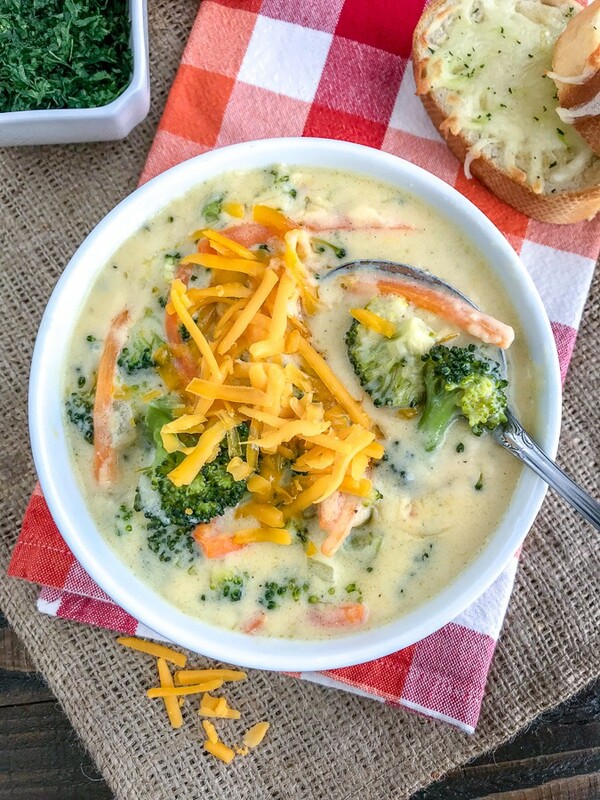 Anyone else a chunky soup lover? I know I am. So if you’re a fan of more broth-style, then I recommend cutting your broccoli florets down a bit more, as well as reducing the amount used. Or increase the amount of broth and half-n-half used. That’s it! 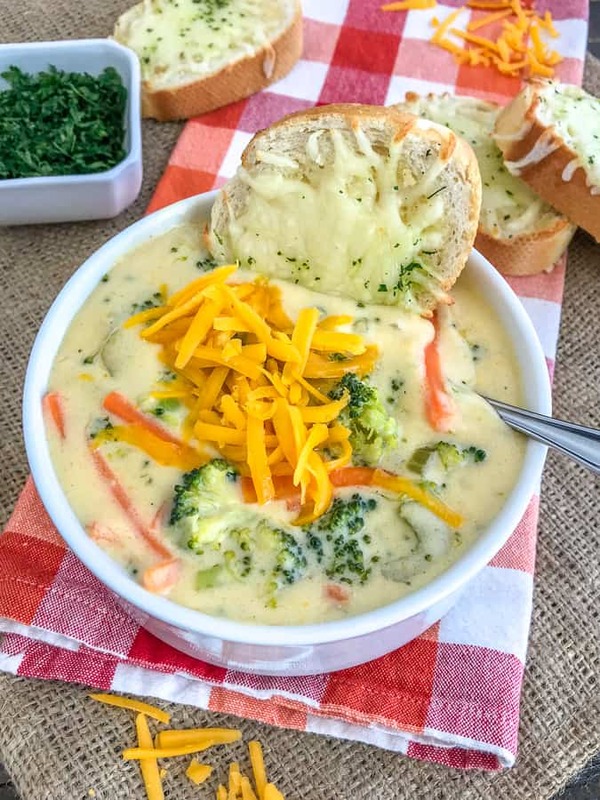 Everything comes together easily in one pot and this soup is delicious garnished with extra cheddar cheese and served with some Easy and Quick Garlic Cheese Bread! Dunk it right in there! You will love it. Don’t have broccoli, carrots, or celery on hand? Here are a few suggestions to add to your soup! Cauliflower florets – or cauliflower rice! Add the broccoli, carrots, celery, butter, garlic, and onions to the crock pot. In a small mixing bowl, whisk together the broth and flour. Season with salt and pepper and add the ground mustard. Pour in the both and stir to mix. 30 minutes prior to the soup being done, add in the half-n-half and freshly grated cheddar cheese. Stir and cover. Allow to continue cooking for the remaining 30 minutes. Garnish with extra shredded cheddar cheese. Select ‘sauté’ on the pot. Add the butter and once melted, add the onions and celery. Sauté until the onions are translucent, 3-4 minutes. Add the minced garlic and sauté for 30 seconds. Stir in the flour and cook for 1-2 minutes or until it starts to brown. Pour in the broth, season with salt, pepper, and ground mustard. Stir. Add in the carrots and broccoli. Close the lid and set the valve to the ‘sealed’ position. Select ‘High Pressure’ for 8 minutes. When the timer goes off, allow for a 10 minute natural release. Turn the valve to open, releasing any pressure that may remain in the pot. Stir in the half and half and freshly grated parmesan cheese. Stir until fully melted. SHELF LIFE: This soup will stay fresh in the refrigerator in an airtight container for 4-5 days. To reheat, simply add to a medium to large saucepan over medium-low heat until warmed through. Add additional broth, if needed, to thin. 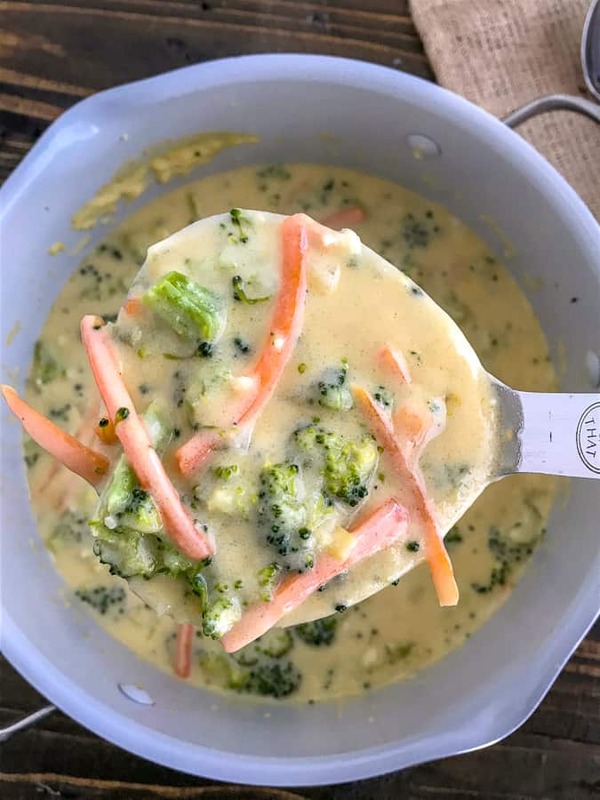 THINNER OPTION: If you’re not a fan of chunky soup, add more broth and half-n-half or use an immersion blender to thin out the broccoli. MILK: I do not recommend using skim or fat-free milk, as you want the fat for flavor in this recipe. Use half-n-half, whole milk or heavy cream. BROCCOLI: You can use fresh or frozen broccoli, but I prefer fresh. The cook time on frozen will decrease as it has already been blanched. BROTH: This recipe calls for chicken broth, but you can use vegetable broth to keep this vegetarian. SODIUM: Use low-sodium or no salt added broth to control the amount of salt goes into the recipe. PROTEIN: If wanting to increase the protein, I recommend added ham or cooked shredded chicken, such as rotisserie chicken. Both are easy toss-in’s at the end to warm. FREEZING: I do not recommend freezing this soup, as it is cream based. Dairy products tend to separate while freezing and thus won’t be as creamy (possibly chunky) when thawed. If looking to prepare this to freeze, I recommend adding the half-n-half when you go to reheat. 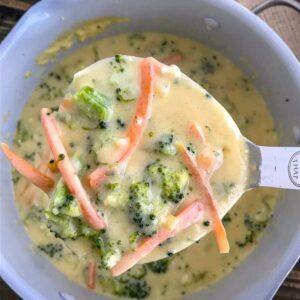 Creamy and savory broccoli cheddar soup that is loaded with broccoli, carrots, celery and freshly grated sharp cheddar cheese. Simple to make and all comes together in one pot! Place a large pot over medium heat. Add the butter. Once melted and bubbling, add the diced onion and celery. Sauté until onion is translucent - 3 to 4 minutes. Add minced garlic and cook 30-60 seconds, stirring. Whisk in flour and cook 1-2 minutes until light or golden brown. Pour in the chicken broth and half and half, whisking continuously until no clumps remain. Season with ground mustard, salt, and pepper. Mix well, stirring until it has thickened slightly. Add the broccoli and carrots, reduce heat and simmer for 10-15 minutes or until the broccoli is fork tender. Use an immersion blender (if desired) to reduce the soup to the consistency you prefer. If not, you can skip this step. I prefer my soups chunky with vegetables, so I did not do this. Gradually add in the grated cheddar cheese 1/2 cup at a time, constantly stirring until all of the cheese is added and melted. Remove from heat. Adjust salt and pepper seasonings, if desired. Serve garnished with cheddar cheese, chives, or toppings of choice! Select 'sauté' on the pot. Add the butter and once melted, add the onions and celery. Sauté until the onions are translucent, 3-4 minutes. Add in the carrots and broccoli. Close the lid and set the valve to the 'sealed' position. Select 'High Pressure' for 8 minutes. When the timer goes off, allow for a 10 minute natural release.